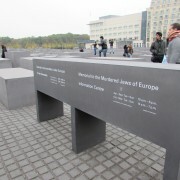 Of the many cities we have visited this semester, the subject of memory appears to weigh the heaviest on Berlin. This weight can be seen in many forms, from memorials to events to museums. 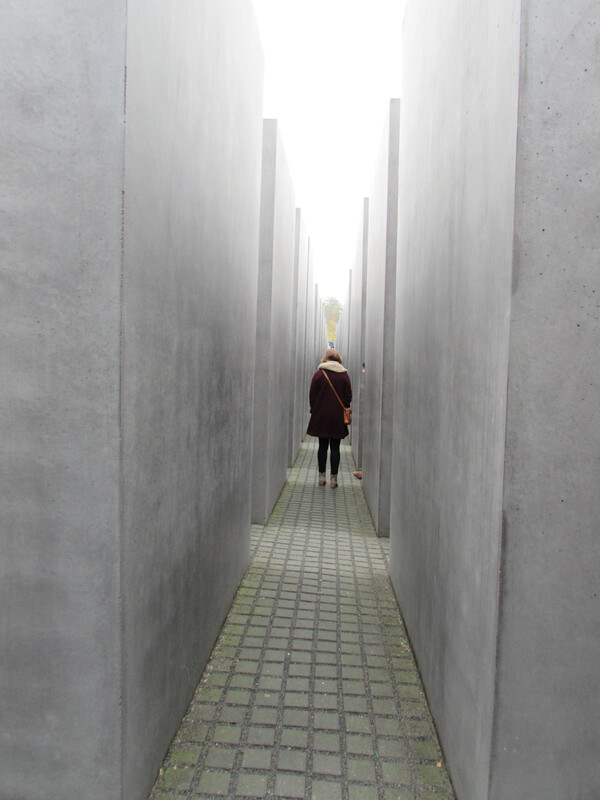 In particular, however, I found the weight of memory to truly feel the heaviest at the Memorial to the Murdered Jews of Europe. 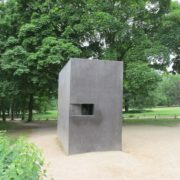 Located around the corner from the iconic Brandenburg Gate and within what was once the “death strip” (the space between the East and West Berlin walls), the Memorial to the Murdered Jews of Europe sits on 4.7 acres of land. 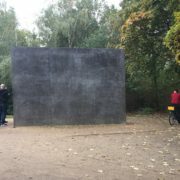 Consisting of meticulously placed unmarked gray concrete slabs of varying heights, the memorial first makes me wonder if I wandered upon a piece of modern art. Instead of first walking through the intimidating monument, I followed our group to the entrance of the memorial’s museum, set just below the surface of the memorial itself. As I adjusted the earpiece of my newly received audio guide, I read the quote that welcomed us to the exhibit, “It happened, therefore it can happen again: this is the core of what we have to say” (Primo Levi). From this quote, the seriousness in which the Germans take the Holocaust is immediately felt, as well as the need for education to try and prevent this from happening again. 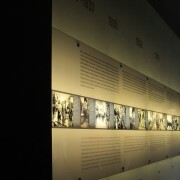 Continuing this theme, the first part of the exhibit that comes into view is a timeline. 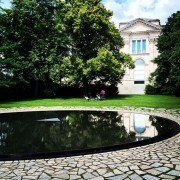 With the aide of the audio guide, I hear and see accounts of persecution and humiliation of the Jews in the 1930’s and through the Nazi Regime. Sitting on a bench across from the timeline I attempt to understand the atrocities taken against the Jews, done often only for their shared religion. Despite how hard I try, I don’t think I will ever come close to understanding how mass genocides can happen again and again in history. When you sit and look at the faces of innocent people being berated and mistreated for long enough, it is hard to continue on without a large pit developing in your stomach. Yet, you are forced to continue. You move from room to room, picture to picture, story to story. Soaking in the many small, individual ways Jews were systematically murdered. 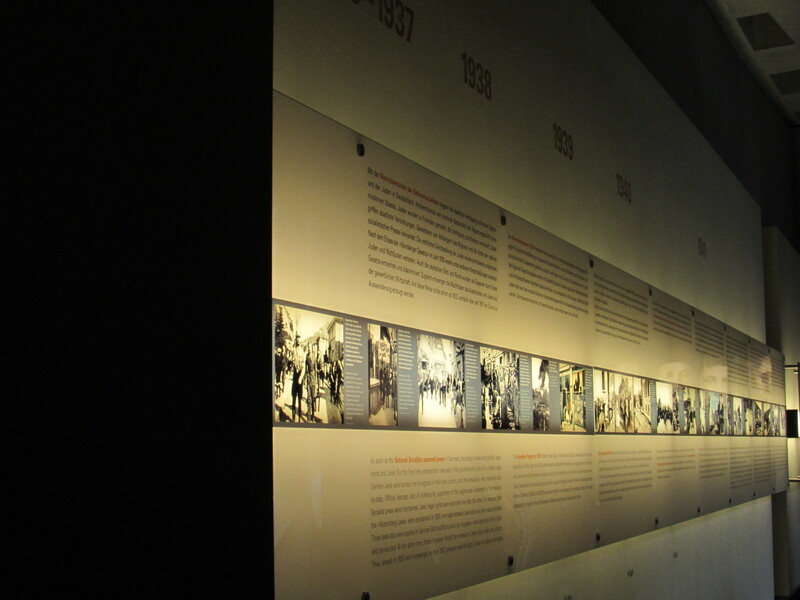 In one of the rooms the numbers of the Jewish people who were killed line the walls, separated into their countries of origin. The numbers range from tens to millions and are altogether unimaginable. With every story of horror and the attempts to cover these mass murders, I start to understand just why Berlin feels to be so weighed down with memory. 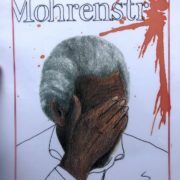 In the Nazi Regime’s attempt to erase an entire people, they also attempted to erase the group’s collective memory. 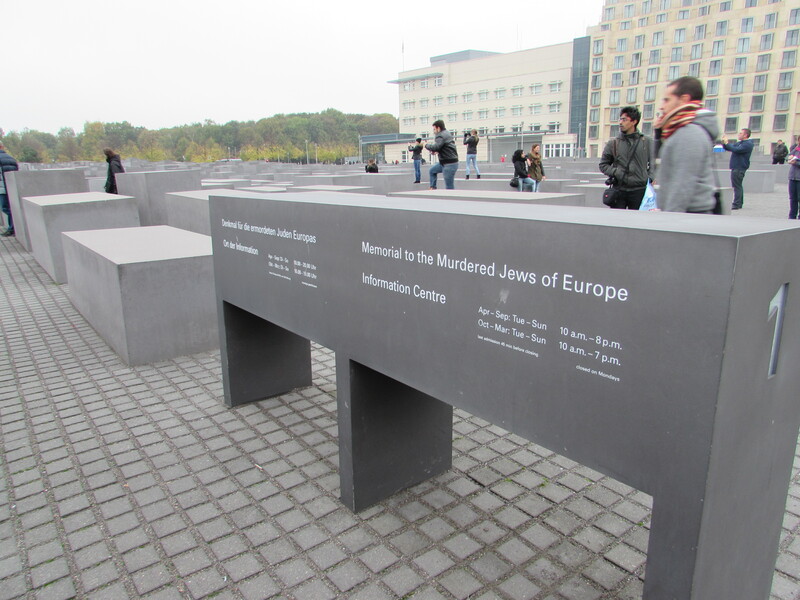 In doing so, Germany is now charged with the moral responsibility to try and share these memories in the process of reconciling with their past. At the end of the tour I return my audio guide and exit the museum. Climbing the stairs that lead you out of the museum, I am surprised to find myself in the middle of the memorial when I reach the top. This quickly leads to my exploring of the memorial. Despite starting in a group, I quickly find myself isolated among the immense concrete stelae. Despite feeling comfortable in my surroundings upon entering the memorial, when the stelae are much shorter and with the presence of my peers, by the time I am at the center alone and with stelae way over my head I feel uncomfortably alone. 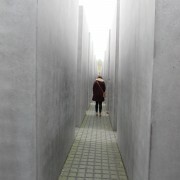 I can hear the screams of small children playing hide and seek among the stelae and see glimpses of other people at most crossing points, yet the feelings of disorientation and loneliness do not go away. When I finally exit the memorial I have a hard time shaking how alone I felt when stuck between the concrete walls, even though I am again with my peers. 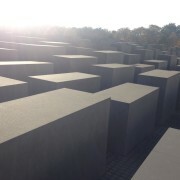 While the Memorial to the Murdered Jews of Europe has been criticized for its empty grey walls and lack of signs, it is definitely capable of leaving you thinking. 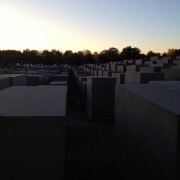 It has been a few weeks since we were in Berlin, yet I still find myself thinking of being stuck in the maze of stelae. 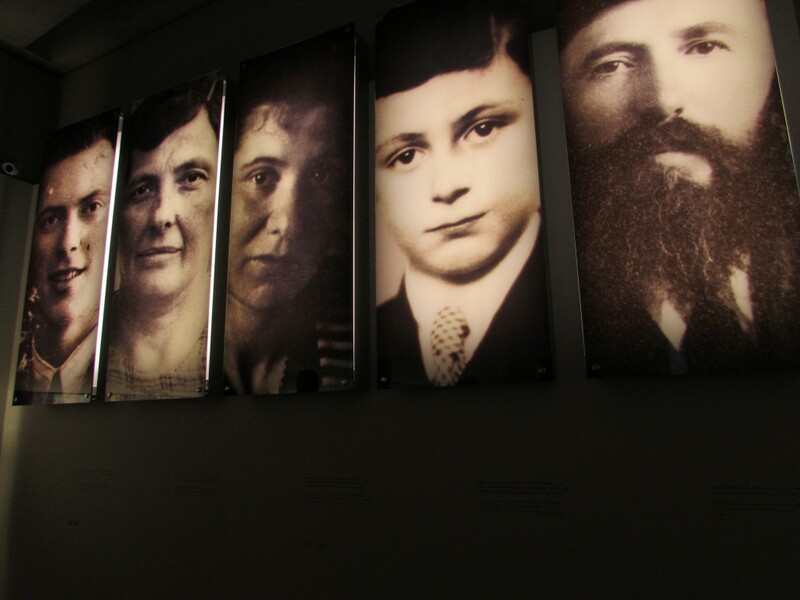 I think of how the loneliness I felt in those few moments must compare to the loneliness of the few Jews that survived the Holocaust as they tried to maneuver through their own disorienting, gray maze of life. I think of how the weight of these stelae makes the disappearance of the collective Jewish memory that much more real and wonder how those memories would have shaped today if they hadn’t been silenced. 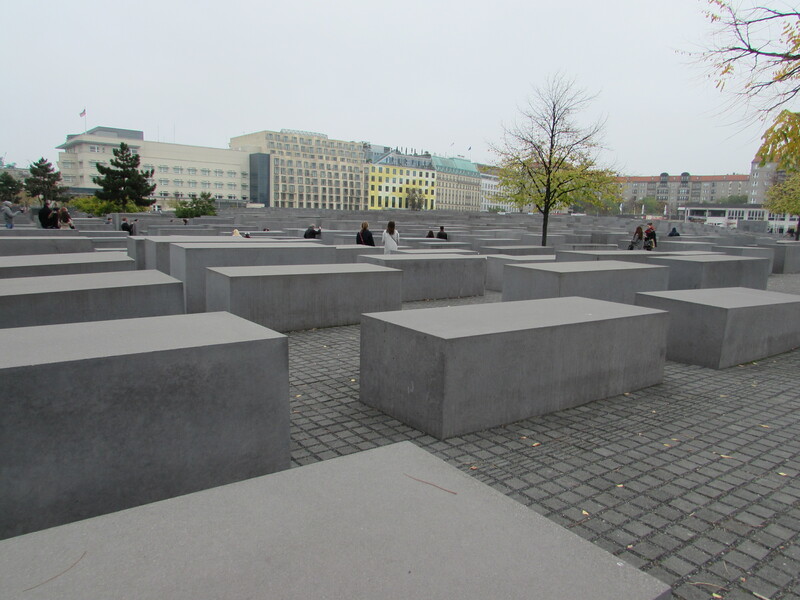 With my visit to the Memorial to the Murdered Jews of Europe, I found a new understanding of what makes Berlin a city of memory. 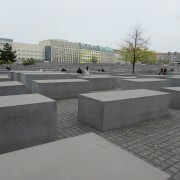 Berlin is not a city of memory out of a desire to be; instead it is a city of memory due to a necessity. It is clear that the recognition of Germany’s 20th century wrongdoings are an essential step on its long road to fully reconciling with its past.